Get On the Juice at Whole Foods Market in Lincoln Park! 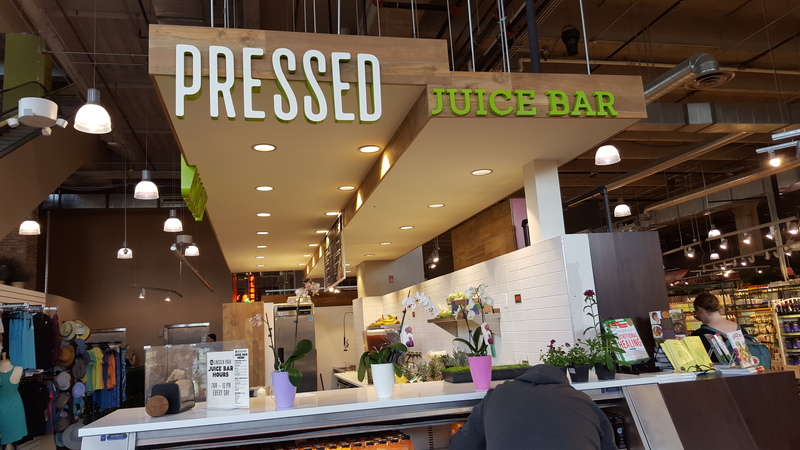 For those that are interested in fresh juice or a fresh smoothly with wholesome healthy ingredients, check out the new Pressed Juice Bar at Whole Foods Market in Lincoln Park! I recall when most Whole Foods markets, and other stores, had juice bars…then over time they disappeared. 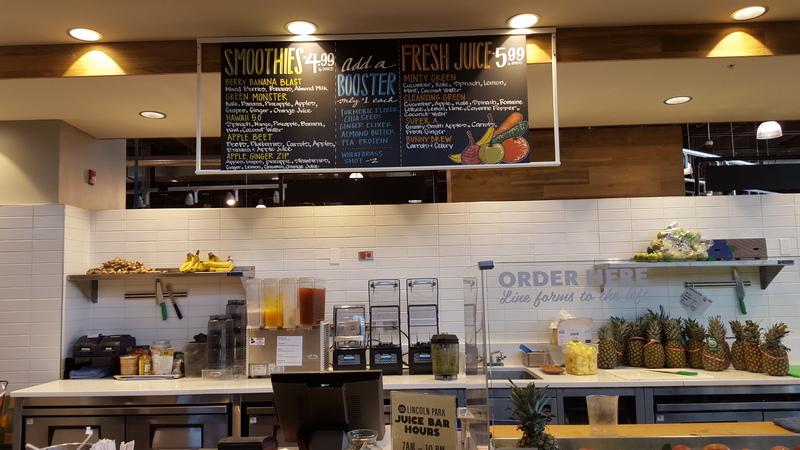 The only way to buy fresh juice has been at a select restaurants. Then in the past few years, the availability of fresh bottled juices has expanded, from Odwalla to Naked to Suja and more. Some people miss the convenience and freshness of in store juice and smoothies! Whole Foods has responded to that demand. Fresh pressed juice..and smoothies, too! 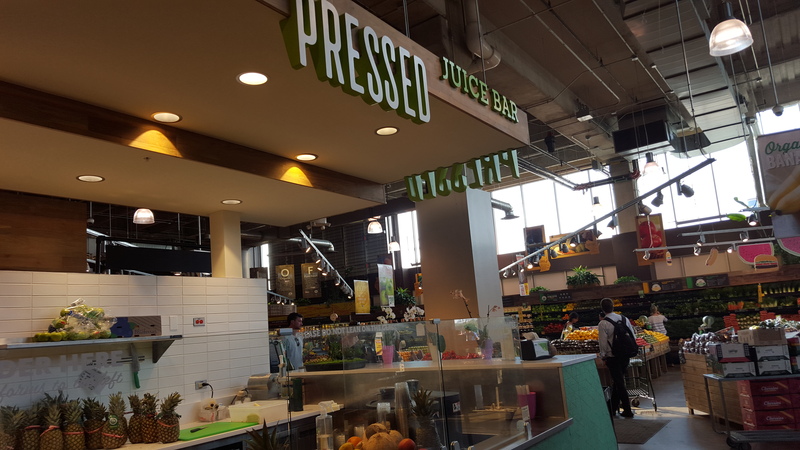 Recently inside the giant Whole Foods Market at 1550 N Kingsbury, the new juice bar also sells BluePrint Juices. According to Whole Foods website, these juices were created for juice cleansing. They pack each bottle is packed with raw, organic fruit and vegetable juices made with a special hydraulic juice press. Fresh from the grocery aisles to the juice bar to you! Why Pressed Juice Over Any Other Kind of Juice? A centrifugal juicer is one in which the blade spins around at a very high-speed which produces heat and can destroy some nutrients. A juice press operates at a slower speed and causes less oxidation. The juice press also uses pressure instead of heat to kill harmful bacteria in a process called “high-pressure pascalization,” or high-pressure processing (HPP). This is an alternative form of pasteurization. According to Whole Foods’ Blog, HPP maintains a high percentage of the juice’s minerals and nutrients. This increases the shelf life of the juice so that it can remain fresh and nutritional for several weeks. Pressed juice that has pasteurized via HPP can be shipped without fear of spoilage. This has allowed more of us to be able to buy nutrient-dense, pressed organic juice!